From Twin Lagoon, we again swam back to our waiting outrigger boat. 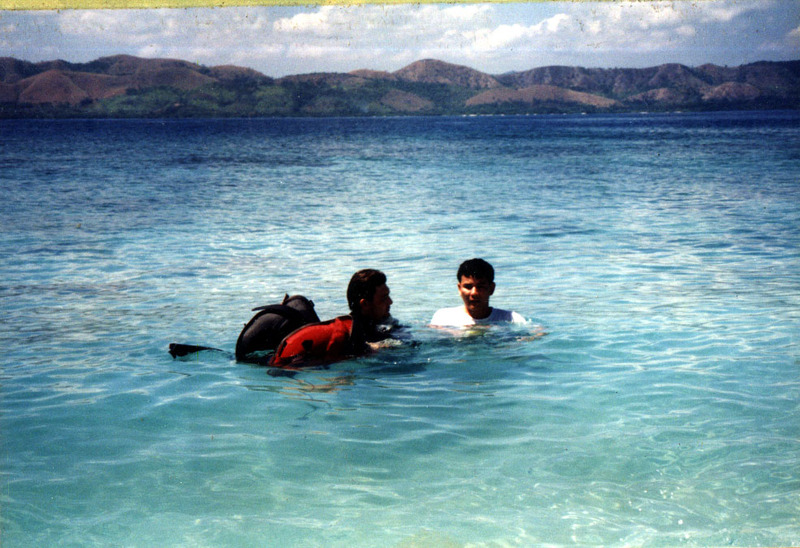 Once boarded with my family, we proceeded to Skeleton Wreck, a snorkeling destination near Banol Beach off the northwest corner of Coron Island. When we arrived at the site, there were already a number of boats, divers and snorkelers milling around the site. We donned our masks and snorkels and swam towards it. The Skeleton Wreck’s name comes from the fact that the keel, ribs and stringers of this old, 25 m. long steel-hulled fishing boat wreck are almost all that are left, giving it a skeletal appearance. It was beached, with the bow a dozen meters from Coron Island, and the stern pointing directly away from the island. The top of the wreck is in about 6 m, of water and it sits on a pretty reef. The Skeleton Wreck can also be done as a dive. A pass through on the starboard side of the hull, at 14 m., allows one to swim from the inside of the boat out over the coral reef. It won’t take long to cover the wreck, so those intending to have a long dive here will probably want to finish up on the reef. Beware of sea urchins. This is also a good spot to have lunch and you can have a quick dip before continuing on your tour. It costs PhP100 per person to moor up here. Asia Grand View Hotel: Governor’s Ave., Jolo, Brgy. 5, Coron, Palawan. Tel:(+632) 788-3385. Mobile number: (0999) 881-7848. E-mail: gsd@asiagrandview.com. Manila sales office: Unit 504, Richmonde Plaza, 21 San Miguel Ave., Ortigas Center, Pasig City. Tel: (+632) 695-3078 and 531-8380. Mobile number: (0917) 550-7373 to 75 Fax: (+632) 695-3078. E-mail: info@asiagrandview.com. Website: www.asiagrandview.com. The last leg of our Asia Grand View Hotel-sponsored activity was a visit to Sangat Island Dive Resort where Ms. Rhoanne Rose Bolohabo, AGVH Resident Manager, used to work. From our outrigger boat, Rhoanne, Aylin, Gem, Adora, Joy, Issa, Angelo, Donald and I were picked by the resort’s motor boat while Mike opted to swim the short distance to the shore. The others decided to stay behind on the boat. Sangat Island Dive Resort, occupying a major portion of the southwestern cusp of postcard-perfect Sangat Island, was opened in 1994. It has a 300 m. long white sand beach surrounded by towering limestone cliffs and majestic coconut palms. The resort has 14 enchanting and quaint, native-styled ecologically “low-impact” guest accommodations with Western-styled bathrooms and ceiling fans, built with locally-available materials such as hand-woven bamboo wall panels, split-bamboo flooring and cogon grass or nipa palm roofing. They include beachfront and hillside cottages on stilts, a family-friendly bungalow suite complex, the exclusive Hilltop Chalet and the exquisite tri-level, two bedroom Lambingan Villa which has it’s very own private beach. A special one, dubbed the Robinson Crusoe Cottage, is located on an isolated beach off the southwestern coast of the island. The resort also has an open-air, beachfront restaurant facility, two full-service bars (the Sangat Island Bar and the open-air, above water Rock Bar), fitness center and souvenir shop. The Sangat Island Bar has a comfortable conversation lounge and a billiard table. The island’s tropical waters, teeming with colorful aquatic life, is also home to 11 historically important World War II ship wrecks. Ten of them are Japanese warships and supply ships sunk by 24 Curtiss SB2C Helldiver dive bombers and 96 Grumman F6F Hellcat fighter escorts (some carrying bombs) of the U.S. Navy on September 24, 1944. Eight of these are a scant 5 to 30 min. boat ride from the resort’s beachfront. Sangat Island Dive Resort has a internationally-renowned, comprehensive on-site water sports (sea kayaking, jetskiing, windsurfing, Hobie Cats, etc.) and scuba diving center dive facility with knowledgeable dive center attendants and licensed on-site PADI and SDI instructors. They offer a wide range of first-class tanks, wet suits, masks, fins, dive computers, and more, plus an air and Nitrox filling station (powered by dual BAUER K14 compressors) and a brand new LW 280 unit which is combined with a 280 Coltrisub nitrox membrane. How to Get There: Sangat Island is a 45-min. 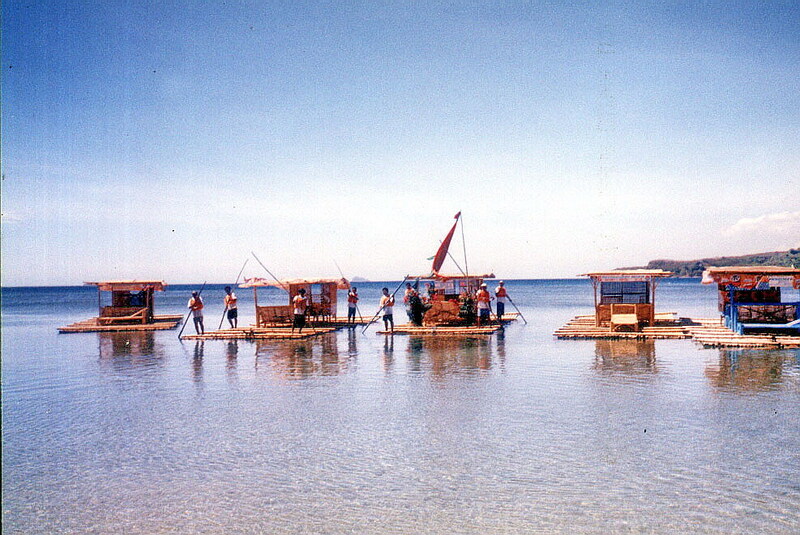 motorized outrigger boat ride from Coron town. How to Get to Coron: Skyjet Airlines has 4 times weekly (Mondays, Wednesdays, Fridays and Sundays, 10:30 AM) flights from Manila (NAIA Terminal 4) to Coron (Francisco Reyes Airport). Travel time is 30 mins. Skyjet Airlines: Manila Domestic Airport, Parking A, Terminal 4, NAIA Complex, Brgy. 191, Pasay City, Metro Manila. Tel: (02) 863-1333. E-mail: sales@skyjetair.com. Website: www.skyjetair.com. 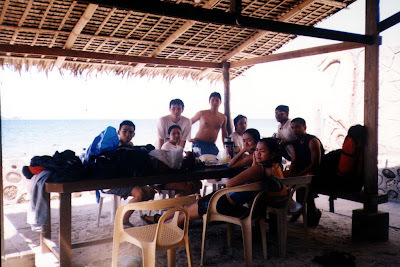 The next day, after breakfast at South Sea Restaurant, Charmie, Joy, Lester, PJ and I, with Mr. Pete Dacucuy, boarded Sheridan Beach Resort & Spa’s Toyota Grandia van for the 25-min. drive to a beach at Ulugan Bay, a 7,200 hectare bay located on the central, western coast of Palawan which is opened to the northern end of the West Philippine Sea. Situated 47 kms. from Puerto Princesa City, the very deep (no less than 14 fathoms) bay is known for its distinct coastal mangrove forest that is associated with tidal flats. It has 790 hectares of coral reefs and seagrass beds, and smaller bays. It also has two islands and three islets. The tiny Tarakawayan Islet, at the head of the bay, lies nearly half a mile offshore, between the Kayulo and Bahile Rivers. South of Tarakawayan is White Rock Islet (or Puting Bato). Reef Islet, locally named Manyokos, lies on the eastern portion of the bay, near Marabay Point. The 140 ft. high Camungyan Island, more popularly known as Tres Marias Island, is a 3-peaked rock formation and dive site about 2 hrs. by boat from Brgy. Baheli. Our destination was to be the elongated, 25-hectare Isla Rita where we were to have a picnic as guests of former city mayor Edward S. Hagedorn. From the beach, we had to walk some distance to board our big, motorized outrigger boat as it was low tide and the water very shallow. The boat trip took about 20 mins. and we docked alongside a plastic pontoon dock in front of the resthouse. 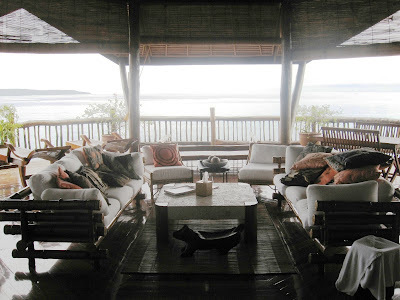 The 2-storey, native-style resthouse, elevated on concrete stilts, had a spacious wooded porch overlooking the sea at the lower level and a balcony at the second level. Nearby was a wood and bamboo gazebo, toilet and shower rooms and quarters for the caretakers. Measuring 1.5 miles in length from north to south, and about 200 yards in breadth, it has white sand beaches on its southwest side. The island also has a detached rock at its northern extremity, the 45 ft. high Observatory Rock which extends in a northerly direction for about 400 yards. The island is also a popular dive site. On the northwest side, the seabed slopes to 9 m. then drops off to 20 m.. Both shelf and wall have lots of hard and soft coral. Big garoupa and snappers, small reef fish and giant clams are plentiful. Diving season is November to June. There was to be no scuba diving for us but we availed of the next best thing – snorkeling. PJ and I donned snorkels, fins and goggles provided for us and walked towards the dock where, just underneath, were two colorful giant clams (Tridacna gigas). Though we didn’t encounter the big garoupa and snappers as I was snorkeling along a staghorn coral forest just near the shore, I still saw a lot of small, colorful reef fish including a pair of Moorish Idols. After our lunch at the Island Pavilion Restaurant, Lara, Joy, Jimbo, Rachelle, Risa, Leica (Pete’s daughter) and I decided to burn some calories by doing a hike, with a resort guide, around the 24-hectare island. Liana and Kaycee opted to stay behind to rest. The nicely laid out hiking trail (open from 6 AM – 4 PM) started as we descended the steps down from the restaurant and traversed the cliffside pathway, strewn with coral rock, overlooking the natural lagoon where we could see a number of guests kayaking. Soon enough, we entered the lush forest. Along the trail are colored pennants tied to trees that indicate the difficulty of the trail – yellow for beginners, blue for moderate and red for advanced. Soon we reached a fork in the trail. The trail on the left traverses the northern point of the island where panoramic views of white sand beaches along the northwestern and eastern shores of the island can be seen. The trail on the right cuts through the spine of the island and leads up to the island’s highest point, 28 m. above sea level, where a lighthouse and a Spanish-era baluarte (watchtower) is located. We chose to explore this route. The concrete lighthouse on the top wasn’t much. It didn’t have a hollow core with a spiral stairway leading to the top, a feature found in many lighthouses. Instead, steel, U-shaped ladder rungs imbedded in the concrete exterior was used. The quadrilateral, heavily overgrown but still relatively intact baluarte was more interesting. It was part of a network of watchtower and fortlets, extending from Santander to Sibonga, built by Augustinian Fr. Julian Bermejo (pastor of Boljo-on from 1804-1836) to warn the townspeople of the approach of pirates. Lara and Joy entered the watchtower through a small, square hole in one of its sides. From this vantage point, we now made our way down the trail to the pristine blue waters of the western side of the island where part of Sumilon Island Marine Park is located. 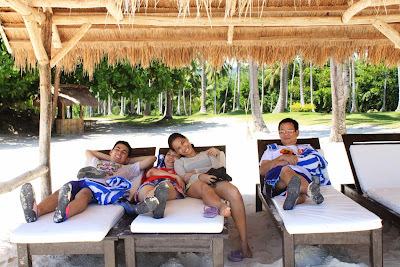 Situated off Cebu’s southeastern coast, 5.5 kms. east northeast of Tanon Point, this marine sanctuary was formerly administered by Siliman University in Dumaguete City (Negros Oriental) as evidenced by a now abandoned hut of the marine station along this part of the trail. Today, the sanctuary is managed by the resort. Motorized water sports such as jetskiing and water skiing are not allowed to ensure that the sanctuary is not disturbed. However, fine snorkeling, over coral gardens, can be done along the western, northern and eastern sides of the island. For scuba divers, it offers waters two to 5 m. deep and 200 m. wide and a drop-off about 100 m. off the southwest coast with spectacular underwater life including the big garoupa. Large schools of jacks, manta rays, sharks, barracudas, sea snakes, turtles and even an occasional whale shark can be seen off the northern and southern tip. Dive sites here include Coral Landscape, Garden Eel Plaza, Julie’s Rock and Nikki’s Wall. Diving season is all year round. Visibility reaches 30 m. and average depth is 20 m. with a maximum of 35 m.. Waters here are usually calm with strong currents to sometimes very rough, fierce and physically demanding currents. 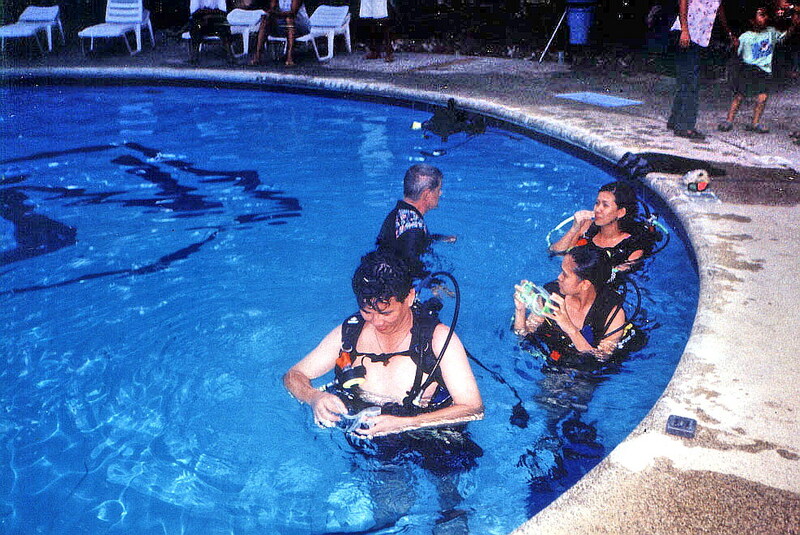 The resort has a dive shop (Aquamania) with certified dive instructors and extensive diving facilities. Further down the trail, we soon reached the island’s white sandbar, the only part of the island that is open to the public. It shifts and changes its shape with the tides and the current. Here, we can swim, snorkel or sunbathe. It was also the setting for last night’s al fresco dinner. When we passed by, it was already set up for a marriage proposal, with a table for two, surrounded by flower petals shaped into a heart, set up along the beach. Nearby, along the sand, were the words “Will you marry me?” etched with pieces of tree branches. On our way back to our cottages, we passed by a grotto with a statue of Our Lady of Fatima and, just past it, the short and seemingly man-made Yamashita’s Cave. We entered the latter and were surprised by a Halloween set-up, meant to scare visitors, at its very end. We were totally drained and drenched with sweat by the time we returned to our rooms. 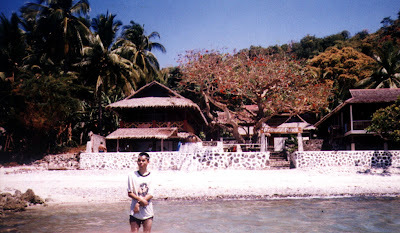 Sumilon Bluewater Island Resort: Brgy. Bancogon, Sumilon Island, Oslob, 6025 Cebu. Tel: (032) 382-0008 and (032) 318-9098. Mobile numbers: (0917) 631-7514 and (0917) 631-7512. Email: info.sumilon@bluewater.com.ph. Cebu City booking office: CRM Bldg., Escario cor. Molave Sts., Lahug, 6000 Cebu City. Tel: (032) 412-2436. Mobile numbers (0917) 631-7508 and (0998) 962-8263. E-mail: sales.sumilon@bluewater.co.ph. Manila Office: Rm. 1120, Cityland/Herrera Towers, 98 Herrera cor. Valero St. Salcedo Village, Makati City. Tel: (632) 817-5751 and (632) 887-1348. Fax: (632) 893-5391. E-mail: sumilon@bluewater.com.ph. Website: www.bluewatersumilon.com.ph. 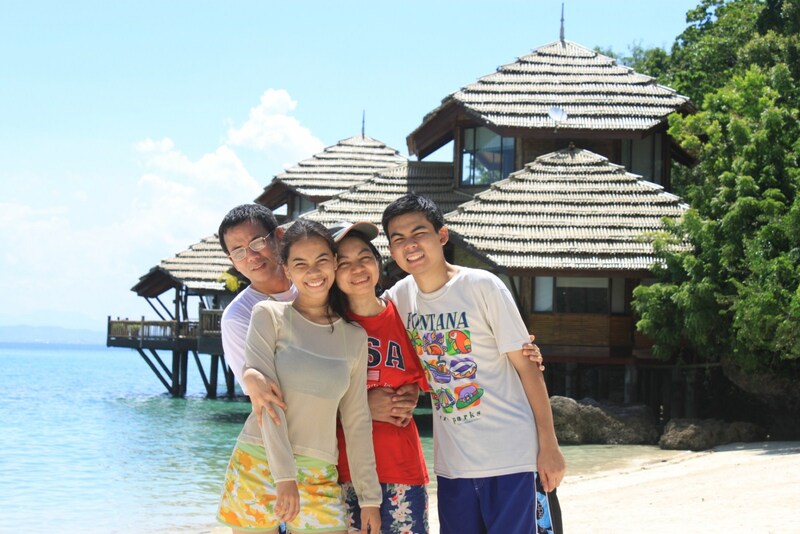 On our second day at Pearl Farm Resort, Grace, Jandy, Cheska, my in-laws and I decided to crossed over (a 2.5-min. boat ride) to the secluded, 7-hectare Isla Malipano and check out its facilities. 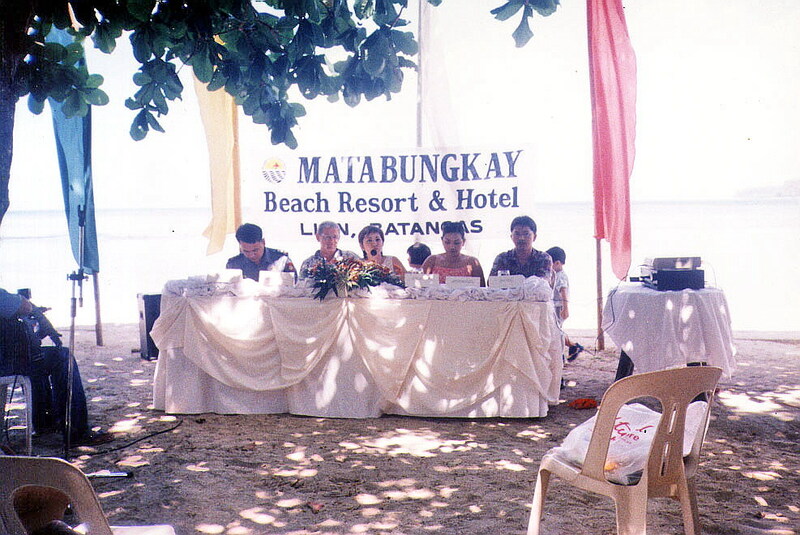 We were dropped off at the 200-pax, octagonal and multi-functional Malipano Gazebo at the other end of the island, a perfect alternative for weddings, theme parties and other occasions. My in-laws decided to stay here while we went around the island. Also a part of the resort, Isla Malipano has a white sand beach, an offshore reef plus 7 lavishly-decorated, 3-storey private luxury villas, each with a wide veranda with breathtaking views of the Davao Gulf. Small barbecue parties can be held at the veranda. The villas are composed of 3 octagonal structures with reception areas, guest suites and dining area, all around a cantilevered deck. Their roof design is patterned after the salakot (traditional Filipino hat). Four of the villas are perched on stilts directly above the sea while the 3 other villas are built over rock outcrops on the beach. Five villas have 3 bedrooms (with 2 queen-size beds and 2 single beds or 3 queen-size beds) while 2 villas have 4 bedrooms (with 3 queen-size beds and 2 single beds or 4 queen-size beds). All villas are airconditioned and equipped with minibar, coffee and tea making facilities, safety deposit box (at the master’s bedroom), cable TV, hair dryers, spacious living room and toilet and bath (the master’s bedroom has a bathtub). Butler service is available for food orders and other guest assistance while a standby speedboat is available to transport guests to the restaurant and other resort facilities. The island is also ideal for scuba diving as the wrecks of two World War II Japanese freighters are located 60 m. away and in front of the resort. The 40-m. (132-ft.) long Wreck I is located just a few meters from the resort’s Samal houses, in 35 m. (115 ft.) of water. Here, you can find groupers, jacks, moray eels and others. For advanced divers, an open bay hatch allows safe penetration. It is also recommended for underwater photography. The slightly smaller, 35-m. (115-ft.) long Wreck II rests on its side at a shallower dept of 28 m. (98 ft.) of water. 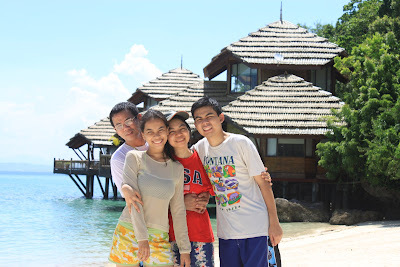 Pearl Farm Resort: Kaputian District, Island Garden City of Samal, Davao del Norte. Tel: (082) 221-9970 to 73. Fax: (082) 221-9979. E-mail: pearlfarmresort@fuegohotels.com. Website: www.pearlfarmresort.com. Davao Citysales office: G/F, Anflocar Corporate Center, Damosa Bldg., Lanang. Tel: (082) 235-0876 and 234-0601. Fax: (082) 235-0873. E-mail: dvosm@pearlfarmresort.com. Manila sales office: 15/F, 1504 Corporate Center, 139 Valero St., Salcedo Village, Makati City. Tel: (632) 750-1896 and 98. Fax. (632) 750-1894. E-mail: mlasm@pearlfarmresort.com. On the day prior to my departure, I was invited to joined a picnic at Country Nook hosted by youthful Basco Mayor Manuel Viola, again feasting on true Ivatan seafood fare. Country Nook had a couple of magnificent rock formations just offshore. Joining us was Ms. Carol Pobre (of DOT Region II) and Francis “Chico” Domingo, a certified PADI divemaster and A.D.S. instructor. They were to dive deeper portions of Batanes’ marine environment which is rich with marine resources. Batanes is one of the few remaining sites where pink and red corals (Corallum sp. ), some of the rarest sea corals in the world, are found. Chico has a vast knowledge of the province’s dive sites. I could only watch in envy as Carol, accompanied by Chico, explored the offshore marine sanctuary’s beautiful underwater scenery and marine life. I was offered and wanted to join them but, according to Chico, diving wasn’t allowed 12 hours prior to my flight (I was leaving 8 AM the next day). Carol was leaving a day after my departure. However, my disappointment was later dispelled by a beautiful Batanes sunset. Panglao Island’s deep waters are home to whales and dolphins that appear all year round, especially between the months of April and June. Having arrived on the last week of May, we were hoping to do some dolphin watching of our own at nearby Balicasag Island which lies off Panglao Reef, 4 kms. southwest of Duljo Point. 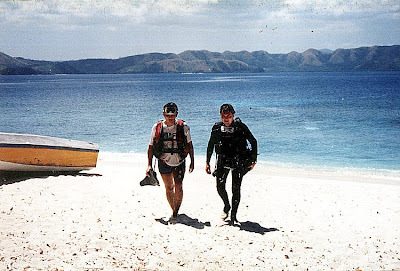 Balicasag is also touted as the country’s second best diving spot. The island’s north and northwest side has a narrow shelf, 10 to 50 m. wide and about 7 m. deep, ending in 2 excellent vertical walls that fall forever. In fact, 80 to 90% of the tourists who visit Panglao come primarily for the Balicasag scuba diving. 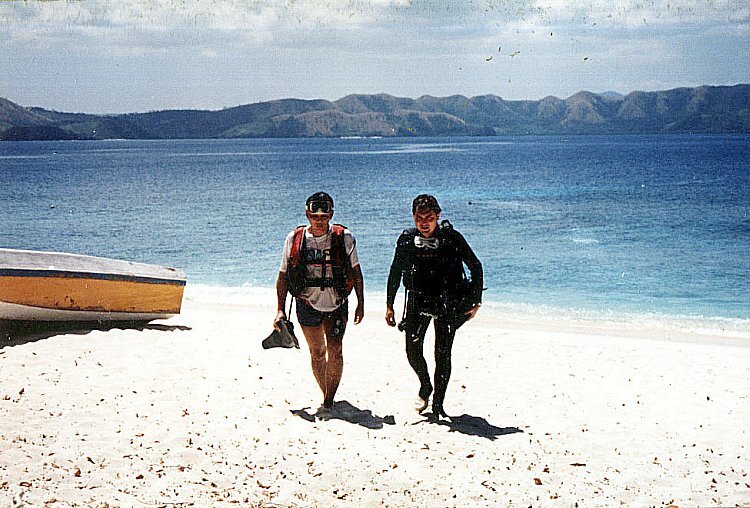 The first recorded dive of the island on the island was done on May 6, 1984. To get to the island, I hired an outrigger boat. Grace, my kids Jandy and Cheska and my brother-in-law Mark joined me and we all brought our swimming and snorkeling gear, suntan lotion and some packed lunch. We left very early in the morning for the 10-km. (45-min.) boat ride to the island. However, throughout the boat tour, we failed to sight any dolphins or whales and so we contented ourselves with snorkeling its beautiful underwater scenery just off the shore. We later made a landfall at the other side of the flat, barren 21-hectare island which is ringed by a pristine sandy shell, coraline beach. 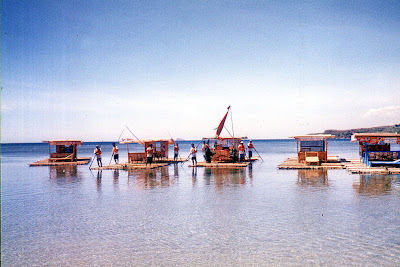 The island’s name was derived from the Visayan words bali, meaning “change,” and kasa, meaning “noise,” in reference to the waves slapping the shore as the wind changes direction. The island was declared as a lighthouse reservation as early as 29 October 1907. Jandy and I went around the island in less than half an hour. On the southwest side of the island is the 1.5-hectare, Philippine Tourism Authority (PTA)-managed Balicasag Island Diving Resort, established on April 6, 1987. Right in front of the resort is a 3.44-hectare marine sanctuary declared by the Department of Environment and Natural Resources (DENR). The resort has 10 native-style duplex cottages with bath and porch, plus a main restaurant pavilion with an adjacent alfresco dining area and bar. It also has a dive shop offering dive courses. A chilling, foggy morning greeted me when I woke up. It was already sunrise but the sun was obscured by the clouds. We soon had breakfast prepared, packed our gear and waited for our “porter” and guide to arrive. In the meantime we posed, as mountain conquerors would do, behind our cameras. Our guides soon arrived and similarly unburdened, we easily proceeded down the mountain and back to our starting point. After refreshing drinks at the store, it was back to our car for the now downhill, but nevertheless still treacherous, drive down the zigzag road. The guys hiked down to their car further down the road. 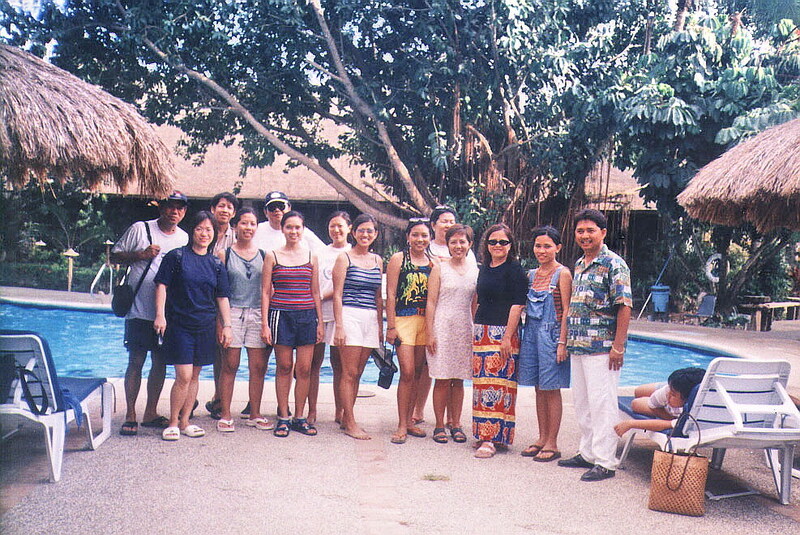 We decided to all meet at Arthur’s Place to savor what Anilao has to offer underwater. The beach here was a relatively shallow. Offshore is a dive site aptly named Arthur’s Place, gradually sloping from five to 21 meters with plenty of reef fish, small coral heads, soft corals, feather stars, hydroids, anemones and sponges. The resort, opened in 1984 (with two rooms) by the late Arthur Abrigonda was, together with Aqua Tropical Sports (opened in 1967) and Aquaventure Reef Club, the first to open resorts in the area. It now has 12 rooms with bath (two of them airconditioned), a restaurant, dive shop, picnic tables, shower rooms and offers two boats for diving trips. None of us went diving (although Cecil was a trained diver) but we indulged in the next best thing by going snorkeling. Even near the shore, the fish and coral life along the reef was quite good. I’ve tried diving once (in Club Paradise in Palawan) a long time ago. Anilao is sure worth the second try with its coral slopes or steps of small drop-offs, shallow coral gardens among sandy patches, profuse small fish life and numerous crinoids and nudibranches. Some marine sanctuaries have been set up. Diving is good all year round but the best season is from November to May. Arthur’s Place Dive Resort: Anilao, Mabini, Batangas. Mobile numbers (Ms. Estelita M. Abrigonda): (0919) 716-7973 and (0919) 312-3938. E-mail: arthursplace_ph@yahoo.com. Website: www.arthurs-place.com. I was invited to join a media familiarization tour of Matabungkay Beach Resort & Hotel in Lian, Batangas on March 23-24, the weekend preceding Holy Week. Our assembly area was the Department of Tourism (DOT) Bldg. near Rizal Park. I left my car at my wife’s office at Gil Puyat Ave, took a fully-packed LRT train, overshot my designated stop which was U.N. Ave. and dropped off instead at Central Station where I decided to just walk, for the exercise, back to the DOT. I arrived at the DOT cafeteria, huffing and puffing and drenched as a newborn kitten, just in time for breakfast. Joining me at the breakfast table were some of the Who’s Who in travel journalism: Mr. Randy V. Urlanda of Panorama, Mr. Frank A. Evaristo of Manila Bulletin, TODAY veteran photographer Mr. Manny Goloyugo, Ms. Arlene Dabu-Foz of Manila Bulletin, Mr. Romark Mayuga of Manila Times, Ms. Claudeth E. Molon of TODAY, Ms. Lala Rimando of Newsbreak Magazine, Ms. Ruby Gonzalez of Travel Weekly East, Ms. Maggie De Pano of Business World Online, Mr. Michael David C. Tan of What’s On & Expat and Mr. Melvin S. Magtaus and Mr. Dennis Lapan of Lifestyle Asia. Also present, as host, were Ms. Leona DG. Nepomuceno and Ms. Camille Cua of the DOT. Also joining us were Ms. Blessie Zarzuela of Adea Marketing, the TV crews from ABS-CBN (3) and RPN 9 (3) and 2 other DOT personnel. We left the DOT at exactly 8:30 AM for the 3-hr. airconditioned coaster trip to Matabungay. I sat at the lone bucket seat up front with its wide legroom suitable for my 5’-10” frame. I had to buckle up though. The long 105-km. trip via the Sta. Rosa Expressway was pleasantly uneventful until we reached the junction leading to Lian. Here the coaster was bodily stopped by resident “commissioners” out to make a killing this early. This scene was repeated 5 more times as we approached the town and our hotel, the last one a roadblock set up by the barangay soliciting donations for their fiesta. What a damper! This upscale DOT-accredited “Class AA” resort had its beginnings in the 1980s. 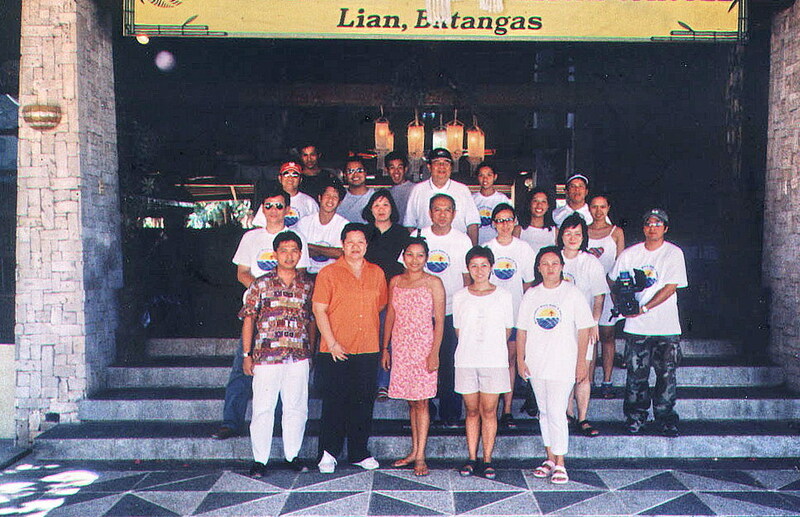 A brainchild of the Levistes of Batangas, it is the largest beach resort and hotel in the Lian/Matabungakay vicinity. The resort was recently named as the “Most Outstanding Beach Resort of 2002” during the 17th Annual Parangal ng Bayan Awards and the 2002 National Consumer Excellence Awards. Proofs of excellence are seen in its 57 combinations of fully-airconditioned superior and executive guest rooms with private bath and spacious veranda plus 12 suites (junior, senior) and villas (Parkview and Seaview). Some rooms have 24-hour satellite TV and in-house movies and minibars. For gourmands, there are four food and beverage outlets. The Café Caballero, open from 6 AM till midnight, offers sumptuous, a la carte, local and international cuisine with live weekend entertainment. The beachside Ihaw-Ihaw Bar & Grill, open 7 PM till midnight, offers char-grilled dishes (including seafood). The Cogon Bar, open, 10 AM till midnight, offers a wide variety of beverages and concocted cocktails. The 50-pax Poolside Bar offers light refreshments and cool drinks. For private dining, parties, social gatherings and company outings, the resort offers the 500-pax Fiesta Area, the 170-pax Pavilion I & II, the 30-pax Wishing Well and the 35-pax Inakaya Private Room. For conferences, seminars, meetings and team building, there are 4 fully-equipped, airconditioned function rooms; the 100-pax Batangas Room, the 50-pax Matabungkay Room, the 40-pax Balayan Room and the 40-pax Lian Room. For the active sports buffs and sun worshippers, the resort has a private 15-m. wide beige sand beachfront, a “Nestea” swimming pool, basketball court, badminton court, 14-hole minigolf, mini-soccer, two floodlit tennis courts, a volleyball area and a giant chessboard area. 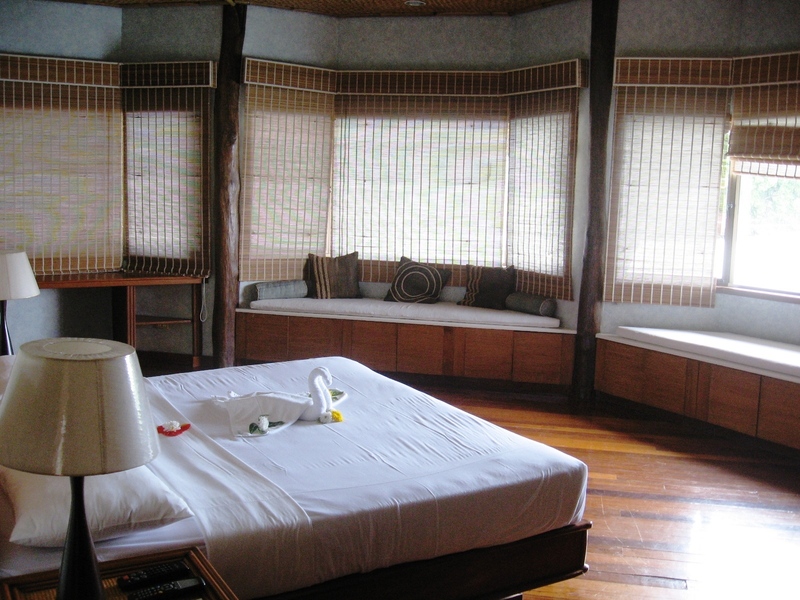 The resort also offers scuba diving (there is a well-equipped dive shop) and fishing. Tired of the sun, stay indoors and visit the Gift Shop (handicrafts, beach wear, etc.) and the Gotcha Club which offers darts, billiards, table soccer, card games, table tennis plus a videoke which offers 7,000 songs, computerized in five languages (Filipino, English, Japanese, Chinese and Korean). The resort is also kid-friendly. Aside from its outdoor playground area and kiddie pool, the hotel was also the first to introduce the “Children’s Paradise” indoor play area (open 8 AM-6 PM) where Playstation, V-tech games, playhouse activities, Barbie dolls, Mattel and Matchbox toys are offered to children guests under the supervision of a nanny (at no cost to in-house guests). The resort also hosts a Hash House Harrier Run (special trekking, running and walking while enjoying nature’s scenic views) every last Saturday of the month and other fun-filled activities during peak seasons. After lunch and a short rest, we were all invited by Marissa to take a ride on one of the resort’s floating bamboo rafts (locally called balsa) where a merienda of pancit bihon and canned soft drinks awaited us. Ideal in Matabungkay’s very shallow beach, the shore is lined with lots of these balsas. They are navigated by long bamboo poles sometimes up to the edge of the drop-off and, once a suitable spot is chosen, anchored in place. All rafts have shaded picnic tables and grills. From the balsa, visitors could go swimming, snorkeling and, at the day’s end, sunset watching. Even after the sun has set, a number of these lighted balsas are used to await fishermen and their much-awaited bountiful catch. These balsas, in effect, have become a very important contributor to Lian’s tourism and livelihood economy. As a tribute to this hardy and durable symbol of Matabungkay, Lian has decided to hold its first Balsa Festival this coming May 17-18. The 2-day festival, proudly hosted by Matabungkay Beach Hotel & Resort, promises to be activity-packed. Highlights are a Balsa Race and the Parade of Decorated Balsas. Different sectors of Lian and the nearby towns will be invited to participate, 80 for the Balsa Race and 60-70 for the Parade of Decorated Balsas. Students from the town’s different secondary and tertiary schools will also showcase their talents in dance and other production numbers. The festival will be capped, on the evening of May 18, by band performances and a beach party. After the raft excursion, Marissa invited us to try our hand at scuba diving at the resort’s swimming pool. I, plus Blessie and Lala, took a crack at it. The others begged off. Mr. Jim Waite, the in-house dive instructor, gave us a brief overview on the basics of diving and its equipment. The much-awaited actual lesson followed and we were soon fitted with masks, snorkel, buoyancy compensator, tanks, weight belts and fins. 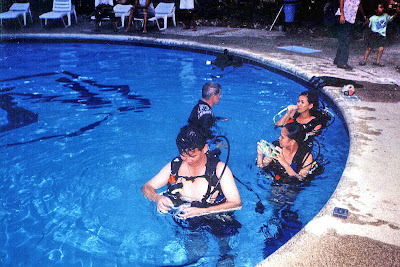 This being my second dive (my first was a trial dive in Club Paradise in Palawan), I was soon diving about at the pool’s floor like a fish within its element. After a much-needed shower, a torchlit dinner was served along the beach. Additional lighting was provided by a bonfire. We were also joined by TV crews of ABS CBN and RPN 9 TV. Immediately after that, we were again invited to a round of nighttime entertainment at Gotcha Club. The girls monopolized the videoke while us guys contented ourselves with rounds and rounds of billiards and table tennis. Still others just watched the girls sing to their heart’s content until the wee hours of the morning. The next day, after a sumptuous buffet breakfast at Caballero Café, we buckled down to serious business with a mini-conference held at the beach area. Invited to the conference were Ms. Charlie Leviste-Antonio (the resort’s Vice-President for Operations), Mr. Jim Waite, Ms. Balangue, Mr. Violeta and the town’s Chief of Police. Here we voiced our concerns (the “commissioner” episode, environmental issues, Holy Week security, etc.) and asked questions concerning the resort’s history, facilities and plans, the upcoming Balsa Festival, scuba diving opportunities and Fortune Island (a sister resort). Immediately after the mini-conference some of us opted, it being Palm Sunday, for a mass (complete with the appropriate palms) held at the resort’s pavilion. 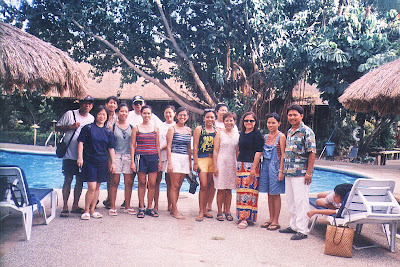 After a late lunch at Café Caballero, we packed up our stuff, had a photo session at the resort entrance and said goodbye to our gracious hosts, Ms. Leviste-Antonio, Ms. Balangue and Mr. Violeta. We left the resort by 2:30 PM and arrived in Manila by 6:30 PM, after a side trip to Calatagan and numerous stopovers at Tagaytay City for fruits, espasol, buko pie and mazapan sweets. 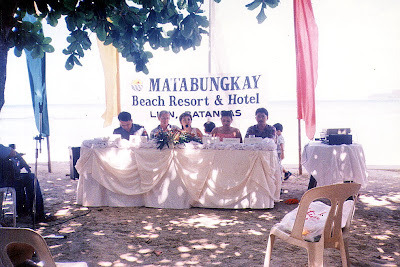 Matabungkay Beach Resort and Hotel: Brgy. Matabungkay, Lian, Batangas. Manila office: Unit H, Garden Floor, LPL Towers, 112 Legaspi St., Legaspi Village, Makati City. Tel: (632) 819-3080, (632) 752-5252 and (632) 751-6685. Fax: (632) 817-1176. E-mail: mrb@matabungkay.net or inquiry@matabungkay.net. Website: www.matabungkay.net. The next day was the anniversary of the EDSA Revolution. I woke up by 5:30 AM for my morning stroll with my videocam. It turned out to be an educational tour as I had my first close encounter with the endangered Calamian hog-deer (Axis porsinus calamianensis). Introduced in the early 1990s, it is now said to number more than a dozen. The sounds of colorful exotic bird life is also evident among the trees as the island is home to orioles, kingfishers, turtle doves and imperial pigeons. It also has a resident baruray or Rufous Night Heron. Although I didn’t see any, there are also monitor lizards (Varanus salvator) and green sea turtles (Chelonia mydas). After breakfast, it was off to my first trial dive. It comes free with the travel package. Tellie and my mom (for obvious reasons) begged off. 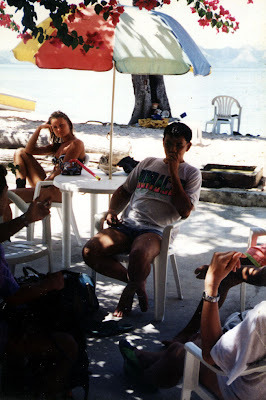 Our divemaster was Mike Olondriz. At first I mistook him for a foreigner, but any notions I had were dispelled after he spoke Tagalog. Later late-evening conversations with him revealed him to be a resident of Magallanes Village in Makati City. 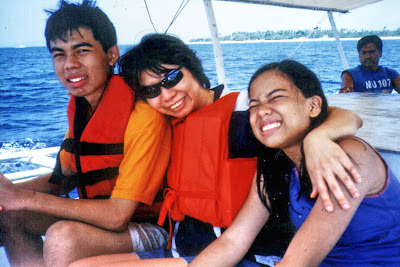 His brother was a barkada of my friend (and SPED teacher of my son Jandy), Inaki Martinez. Small world. Before the actual dive, I had to undergo a lecture on the use of the scuba gear as well as breathing techniques. Then it was off to the beach with Mike. I looked silly as I walked backwards to the beach wearing my fins, but once in the water, I was fitted with my tank, weight belt and mask. The 15-min. dive was easy at first, but when we got to the 15-ft. depth, my ears began to hurt as they felt like popping. We ascended to the 10-ft. depth where Mike handed me bread crumbs to feed the fish. I was soon surrounded by them, large and small, and some of the large fish (probably a Napoleon wrasse) took nips at my bare legs. “Is it ethical?” Books that I have read later have revealed that this fish feeding craze which brings the fish closer for underwater photography also makes them tamer and ideal spear gun targets. Also feeding leftovers could also be fatal as these fish sometimes die of indigestion.